Gorilla Glue Co. makes a few products that I really like and one of those products is the Original Gorilla Polyurethane Glue. But you can't use their glue if you don't have any with you, and who knows when you might need to repair something on the go. To help solve this, Gorilla Glue is introducing Gorilla Glue Single Use packs. 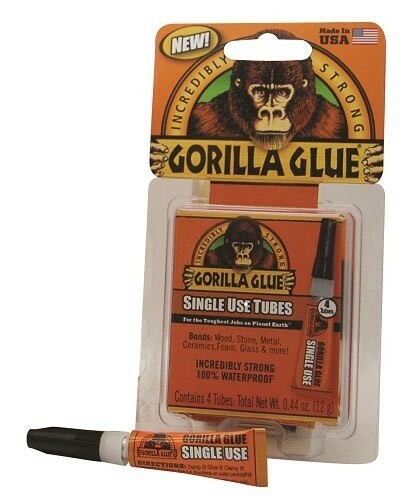 The new Single Use tubes now make it easy to keep Gorilla Glue strategically stashed in different places in case you need to repair something. You can easily keep one in your glove box, tackle box, or any other type of box you use. I am planning adding one to my 72-hour kit. Gorilla Glue Single Use features the same formula of glue that is found in the Gorilla Glue 2 oz., 4 oz., 8 oz., 16 oz., and 36 oz. sizes, and has the ability to stick to wood, metal, stone, foam, glass, and more. Gorilla Glue is moisture activated, but once cured it is 100% waterproof and non-toxic. Gorilla Glue Single Use can be purchased in packs of four "easy-to-use and store" 3 gram tubes.